Our delivery fork buffets dishes can be served on their own, be part of a wider fork menu, or be used to complement finger food menus A Selection of baby rolls & butters are included with all main course dishes. 48 hours notice prior to booking is required. 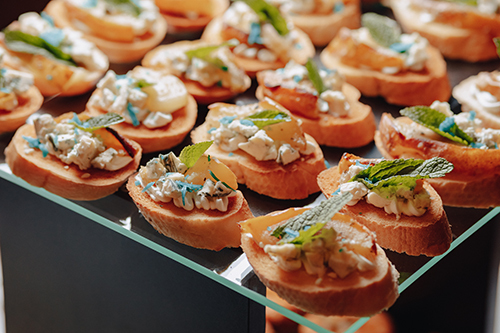 Selection of Cakes, slices of orange, kiwi, melon, sweet pineapple, grapes, passion fruit & seasonal berries and much more Canapés make ideal party food! These bite-sized morsels are guaranteed to impress your guests. Our Mission is to provide each and every client with a culinary experience to remember... Our experience in Events Catering and Corporate hospitality is second to none. Our Aim is to meet and exceed your expectations with innovation & imagination, all types of parties and events from 10 up to 1000 guests.